HOUSTON - NASA is considering adding an extraday and a fourth spacewalk to the space shuttle Discovery?s mission so astronauts can fix astuck valve that is threatening to shut down half of the International SpaceStation's (ISS) systems. The valve, which hasbeen stuckin the closed position since April 8, is part of the space station?s newammonia coolant tank and is needed to regulate the flow of coolant through halfof the station's systems. NASA learned it wasstuck Tuesday while attempting to activate the new ammonia tank after it was hookedup by spacewalking astronauts. 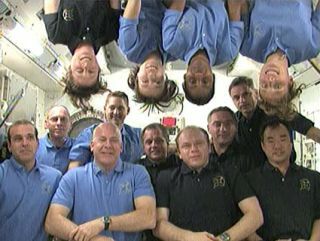 Although not animmediate threat to the station's crew, a functioning coolant system is neededbefore the ISS is subjected to increased heating as a result of its changingorientation in respect to the sun. This high "beta angle" period isexpected to begin around Thursday. Without a fix, NASAwould need to shut down that side of the coolant system ("loop A")before it fails, which would result in the station losing use of the systemsserviced by it, including the Canadian-built robotic arm. NASA is still attemptingto open the valve through ground controlling, but should those efforts beunsuccessful, their "last option" will be to have spacewalkersreplace the faulty nitrogen tank with one of two new ones already aboard thestation. "Folks arecontinuing to troubleshoot that problem on the ground to see if there is otherthings we can try," explained lead station flight director Ron Spencer. "In the meantime, we are also pursuing work on [spacewalk] options topossibly replace the nitrogen tank assembly." While Mission Controltackles the problem, the 13 astronauts aboard the station spentsome time off on Wednesday to rest from their busy flight, which has beenaimed at delivering tons of new equipment to the space station. If an extravehicularactivity (EVA) is deemed necessary, then mission managers will decide betweensending STS-131 spacewalkers Rick Mastracchio and Clayton Anderson out for afourth spacewalk, or wait until after Discovery leaves and have the stationcrew perform the repair. Although tasking theshuttle crew with the spacewalk raises fatigue concerns -- their mission wasalready extended a day as a result of a failed Ku-Band communication antennarequiring they perform "late inspections" of their heat shield whilestill docked to the station -- the trade-off is their expertise. "This task has alot of similarities associated with the ammonia tank replacement," Spencercommented, referencing the primary activity of the three completed spacewalks. "The EVA crew on this mission are familiar with the fluid connections, theelectrical connections and handling a large assembly in space." "So there is anexperience base there that we may choose to take advantage of if EVA isnecessary," he added. A decision is neededby Thursday for NASA to reserve the option of having the shuttle crew performthe spacewalk. "The earlier thedecision the better," said Spencer. "But it is no later thantomorrow.? Discoverylaunched to the space station on April 5 and is due to leave the orbitinglab on Saturday, unless Mission Control decides to extend the flight for theextra spacewalk repair is required.